German beers often get lost in the shuffle among the craft crowd. They are neither flashy nor overdone, just solid brews made from simple recipes with distinctive German ingredients. But there are three that break that mold: gose, Münster altbier and dampfbier. They are obscure outliers, stylistic survivors of the dozens of regional styles that have largely been lost to history (although gose is back in fashion with brewers and drinkers alike). Unusual and easy to brew in authentic fashion, they can be made as all-grain, partial-mash or extract beers, with a starting gravity of 1.050-1.055. These quirky beers present an opportunity to shuffle the ingredients a bit, brew something historical and unconventional, and expand your horizons. Dampfbier (meaning “steam beer”) was largely brewed in the rural Bavarian Forest region, where Germany and the modern Czech Republic share a border. It is a vestige of farmhouse, home and village breweries that resourcefully made basic utilitarian beer. Dampfbier was a fairly common brew into the early 20th century, when the influx of pale lagers, supplanted the local rustic brews of the day. Dampfbier brewers used malted barley from Bavaria and fermented with weizenbier yeast. That’s right: an all-barley brew of Bavarian malts and estery, spicy weizen yeast. Weizen yeast would have been easy to obtain and easily propagated, and being top-fermented, no special conditions were necessary. Dampfbier was born of necessity and frugality, an example of a regional specialty that became popular and evolved into a style. Today, a few commercial German dampfbiers remain, none of which are exported, to my knowledge, and American brewers take a stab at the style on rare occasion. 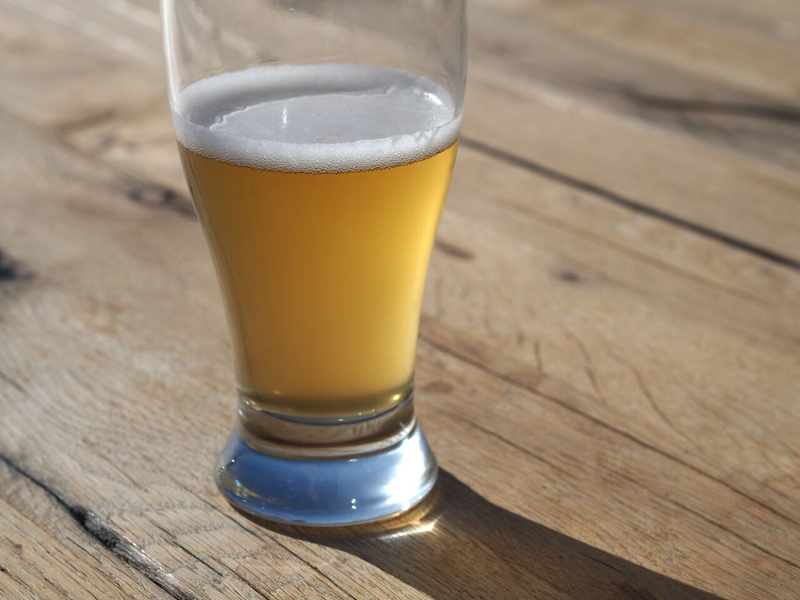 The modern commercial template consists of pilsner and Munich malts, the ratio favoring pilsner malt, about 20 IBUs and traditional Bavarian weizenbier yeast. It is brewed to OG 1.050, give or take, making it a versatile, characterful beer—relatively light, malty, rich and aromatic. Historical recipes would have varied some from locale to locale. Dampfbier is light amber to copper in color, allowing a bit of leeway and creativity with the grain bill, depending on your preferences. Munich malt can be replaced with Vienna, a flavorful base malt. Vienna would make an excellent lighter single-malt dampfbier. Otherwise, blends of pilsner, Vienna and Munich malt in whatever ratio you prefer would fit the style well. Munich malt comes in at least two Lovibond ratings; the darker toast, used for dunkels and bocks, would craft a superb, malty dampfbier. The weizen yeast is the no-compromise aspect of dampfbier, but you can control the aromatic and flavor influence of the yeast nonetheless. Fermenting at the lower end of the temperature range will greatly reduce banana esters, while the higher end will enhance those same qualities. Wyeast 3056 is a blend of neutral ale and weizen yeast, and is an excellent option for tempering the influence of the weizen portion. It is my preference for this style. Use only traditional German noble hops. My favorite homebrew recipe consists of 1/3 dark Munich and 2/3 pilsner malt, 20 IBUs with a dose of aromatic hops (Tetnanger or Hallertauer) and Wyeast 3056. Gose has gotten some attention from American brewers in recent years (with great artistic liberty), and a few brands are imported from Germany (including Gosebrauerei Bayerischer Bahnhof’s, Döllnitzer/Ritterguts and Freigeist). It is the indigenous beer of Goslar, named for the River Gose. The water from the Gose was used to brew the original gose beers, and is said to have had a salty flavor from the local mines. When the mining industry faltered in the 15th century, gose brewing shifted 100 miles east to Leipzig, where it was copiously brewed until the early 20th century. Briefly, gose is made of roughly half wheat and pale barley malt with salted water, has a low hop rate (10 IBUs) and noticeable lactic sourness, and is laced with coriander. Fermented with North German top-cropping yeast, it lacks the intense aromatics of Bavarian wheat beer. Primed conditioning will retain and enhance its natural texture and profile. The basic recipe is wheat malt (60 percent) and pilsner malt (40 percent), German noble hops (10 to 15 IBUs) and altbier or Kölsch yeast. But it is the three other components—coriander, salt and lactic acid in combination—that make this beer unique. Coriander should be added during the final minutes of the boil, in keeping with brewing aromatic rules of thumb, at a rate of ¾ to 1 ounce per 5 gallons of wort. Salt can be added to the boil or mash, ¾ to 1 ounce per 5 gallons. Avoid iodized salt, as the iodine may interfere with fermentation. Plain sea, varietal or kosher salt is appropriate. Achieving proper background lactic sourness is tricky, and there are three ways to approach it: sour mashing or acidulated malt, Lactobacillus inoculation and an addition of lactic acid. If a sour mash is part of the equation, seek an extensive explanation, as it is an involved undertaking. Only a portion of the grain bill, up to 15 percent, will include sour mash. The alternative is acidulated malt, available at any homebrew shop. Acid malt is used to lower mash pH for brewers who have to contend with alkaline brewing liquor, but is also handy in lending mild lactic character. Use it at no more than 10 percent of the total grain bill, and add after the mash has fully converted, after the first 30 minutes, to prevent the low pH from stalling conversion. If used as suggested, residual starch will be essentially unnoticeable. The best and most authentic method is to inoculate the wort or finished beer with a Lactobacillus culture. White Labs WLP677 (L. delbrueckii) and Wyeast 5335 (L. buchneri) are perfect candidates, offering moderate sourness that develops slowly over time. This will allow sampling periodically for sourness until the preferred level is reached and give a range throughout the life of the beer. Pitch with regular brewing yeast or add during secondary fermentation or bottling. The first strategy will result in more intense sourness. Wyeast 5335 is stunted somewhat by hop rates higher than 10 IBUs, so keep that in mind. Liquid 88 percent lactic acid can be purchased at any homebrew shop and is added directly to the beer during bottling or kegging. It will give a more one-dimensional flavor than the other methods, but is a good shortcut. Use up to 2 ounces per 5 gallons. This beer is a representative of the old Münster style: top-fermented, cold-conditioned beer made of pilsner (60 percent) and wheat malt (40 percent). It is fermented with Düsseldorf altbier or Kölsch yeast. Münster altbier is hopped with German noble hops at a rate of 25 IBUs, giving it a fresh and moderately hoppy character. It also has lactic acid background at a subdued level, enough to add complexity without competing with the malts and hops. Use the same strategy as gose for the lactic component. Pinkus Organic Alt is imported by Merchant du Vin and worth trying to get an idea of what this beer is about. American wheat beers are similar but usually lack the lactic highlight. Münster altbier is sometimes consumed with a dash of fresh fruit syrup stirred into the beer in the manner of Berliner weisse, making this an excellent option for summer refreshment.